Hydroseeding is a proven method for establishing blends and mixes of seed. Seed, fertilizer, mulch, soil conditioner, and tackfier are combined with water and placed in our hydroseeding equipment. When all ingredients are thoroughly mixed, the slurry is sprayed over the prepared site. A green "mat" covers the newly seeded area. That's the hydromulch, and it performs these 3 valuable functions. Moisture Retention: Seeds are kept moist because hydromulch retains 10-15 times its weight in water. Water is the key ingredient for a quicker and thicker seed establishment. 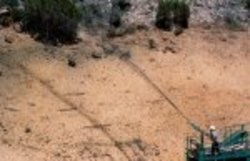 Erosion Control: Wind and water erosion can preventsatisfactory results. Hydromulch "blankets" the area and helps to prevent these problems from occurring. Seed Protection: Hydromulch helps maintain soil temperature and protects young seeds from the scorching sun. It forms an almost perfect micro-climate for maximum germination. As your seeded area becomes established, the hydromulch will gradually decompose and disappear. Hydrostolonizing is a method of establishing turfgrass. 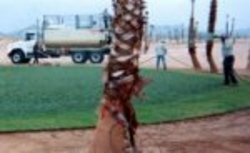 The process much the same as hydroseeding, except instead of seed, "sprigs" or "stolons" are used, and most commonly with bermudagrass. 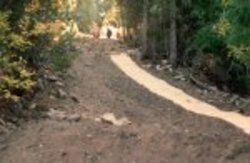 Erosion Control is a practice that reduces wind and water erosion. Plants are used for long-term, low-cost erosion control. Revegetation is, quite simply, covering the ground with plants. Erosion control is just one goal among many. Others include providing habitat for wildlife, improving water quality, providing food for livestock, providing a covering for recreation, or creating a beautiful vista. The area may be irrigated or not, depending on the objectives and the plants chosen. The seeding process is perhaps the single most vital component of a revegetation plan to establish native plants on disturbed areas.